A shot blasting cabinet is a specially designed cabinet which is used to clean and remove surface rust from small metal components prior to their refitting or priming and painting. 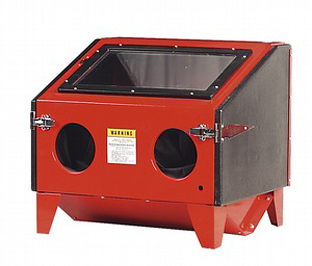 Shot blasting cabinets require a connection to pressurized air supply, and an abrasive media (shot) which is fired at the component under pressure to blast of any debris or rust. Many materials can be quickly damaged in a shot blasting cabinet so make sure that the only parts which are put inside are metal and in need of a repaint.